ALIPAC Activists, I'm going in! 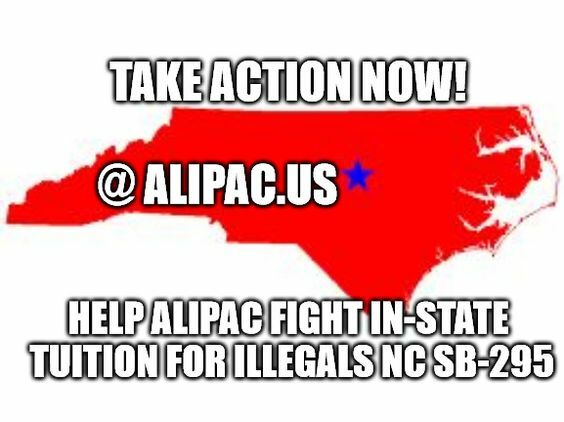 I'm on my way to the NC General Assembly to once again fight the threat of in-state tuition for illegals, which would eventually hand control of this swing state to the illegals and their handlers! I need you to light up these lawmaker offices below with calls and professional, polite, yet firm emails opposing SB 295 while I go door to door and present at the committee meeting this morning at 11 am Eastern! We have a need for speed! The problem with SB 295 is that while it is not specifically written to give in-state tuition to illegals (View Bill Here), it could create a new loophole for illegals to exploit. The bill sponsor Senator Jerry Tilman is not the kind of lawmaker that would intentionally help illegals, so please be kind to him. "Please oppose or change SB 295 to assure that illegal immigrants and non-citizens do not receive in-state tuition benefits to replace American students in our colleges." There are 16 committee members (10 Republicans and 6 Democrats) that need to hear from you before 11 am ET this morning. Last edited by ALIPAC; 04-17-2019 at 08:52 AM. Immediate Action Needed in North Carolina. NC budget allows in-state tuition for illegals loophole!